There’s this guy we know—quiet, unassuming, with black hair and thick glasses. He’s doing his best to fit in, in a world far away from the land of his birth. He knows he’s different and that his differences make him alien, an outsider—but they also make him special. Yet he finds himself unable to reveal his true self to the world. . . .
For many Asian Americans, this chronicle sounds familiar because many of us have lived it. But it also happens to be the tale of mild-mannered reporter Clark Kent, better known as Superman. And the parallels between those stories help explain why Asian Americans have become such a driving force in the contemporary comics renaissance as artists, writers, and fans. Yet there’s one place where Asians are still underrepresented in comics: between the four-color covers themselves. 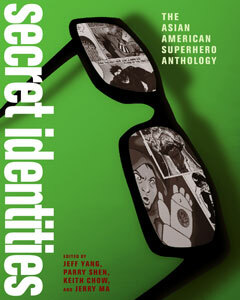 That’s why, in Secret Identities, top Asian American writers, artists, and comics professionals have come together to create twenty-six original stories centered around Asian American superheroes—stories set in a shadow history of our country, exploring ordinary Asian American life from a decidedly extraordinary perspective. Entertaining, enlightening, and more than a little provocative, Secret Identities blends action, satire, and thoughtful commentary into a groundbreaking anthology about a community too often overlooked by the cultural mainstream.